Scoma’s has been an institution at Fishermen’s Wharf, but they also have a quieter location, on the pier, in Sausalito. The main street it’s located on is tranquil compared with the tourist packed Wharf and there are numerous boutique shops to walk around in after dining. Visiting the restaurant in hopes of having amazing crab, I wasn’t disappointed. I had planned on having a half order of dungeness crab … sadly, their lunch menu didn’t offer it. Nevertheless, my crustacean craving was satisfied with their crab cake ($13.50) and crab sandwich ($22.50). Arriving two to an order, the crab cakes ($13.50) had a great seared crust and contained a fair amount of meat. However, the flavours relied heavily on remoulade topping it, while the cake itself was rather plain. 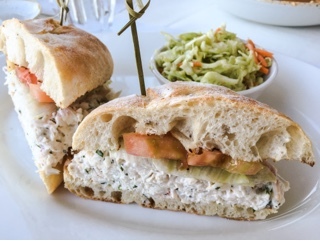 The crab sandwich ($22.50) was huge and packed with so much shredded meat mixed with a celery seed spike mayonnaise. 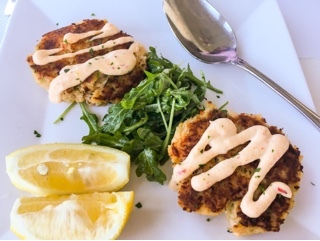 Sandwiched in between a soft toasted ciabatta roll with lettuce and tomato, it was delicious, highlighting the crab’s natural sweetness so nicely. Another starter we shared, the coconut curry mussels ($18), certainly didn’t lack flavour. The coconut thai curry broth had enough heat without being overpowering. There was a garlicky essence to it that melded nicely with the coconut milk. 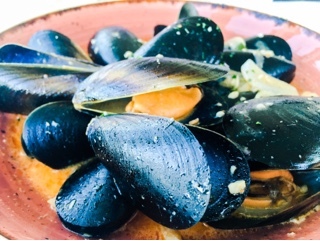 Meanwhile, the mussels were plump, meaty and delicate tasting. We couldn’t get enough of the sauce and even needed an extra order of bread to soak it up. 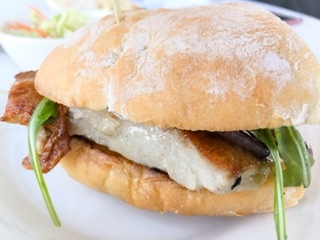 A large slab of beautifully seared fish was in the Ahi tuna sandwich ($19.95). Since it was very moist, the sandwich was rather hard to eat … the bun could hardly contain it! However, I couldn’t help but think the sandwich was missing something as the flavours were somewhat muted. A stronger glaze or crunchy vinaigrette based slaw would have been nice instead of the regular spring mix. If a table in the light filled dining room overlooking the bay or patio is almost available, it’s worth the wait. 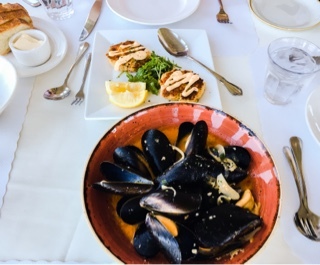 It’s a wonderful experience to enjoy fresh seafood while taking in the picturesque view of the San Francisco Bay.